FLUOR FIELD (Greenville, SC) - The Greenville Drive jumped out to an early 4-0 lead after the first inning and the Lexington Legends fell in game three 7-2. The Drive put up four runs in the bottom of the first inning. Kervin Suarez led off with a single to center field then reached second on a fielding error on a ball hit by Ryan Fitzgerald. Jarren Duran singled home Suarez and the Drive was on the board, 1-0. With two runners on base, Tanner Nishioka blasted a three-run home run to centerfield and Greenville led 4-0. Greenville continued to score in the bottom of the third inning. Everlouis Lozada singled to left field then advanced to third on a double by Samuel Miranda. Jordan Wren grounded out to the second baseman, but Lozada scored. In the bottom of the fourth inning, Ryan Fitzgerald singled to centerfield and advanced to third on a throwing error by first baseman, Nick Pratto. Nishioka then smacked an RBI single to right field and Greenville continued to lead 7-0. The Legends plated their first runs in the top of the ninth inning. Jeison Guzman was hit by a pitch then moved to third when Pratto doubled to left field. With Brewer Hicklen at the plate, Samuel Miranda allowed a passed ball and Guzman scored. Hicklen then reached base on a throwing error by the third baseman and Pratto scored to make it a 7-2 ballgame. 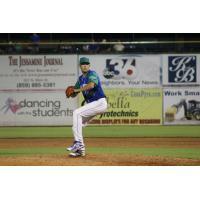 Collin Snider was given the loss for Lexington tossing 3.0 innings allowing seven runs (five earned) on 11 hits while striking out four. Jhonathan Diaz was awarded the victory throwing 7.0 shutout innings allowing four hits while walking one and striking out six. The Legends and Drive meet for the regular season finale tomorrow, September 3 at 2:05 p.m. Fans can purchase ticket packages for the entirety of playoffs held at Whitaker Bank Ballpark. Prices range from $24 Box Seats to $66 Diamond Club seats for all three games which are slated for September 5, 10 and 11. All purchases are final. Any games not played or if the Legends are eliminated from the playoffs, accounts will be credited for 2019 tickets and ticket packages. For the September 5 game, fans can purchase a Rough & Rowdy Ticket Package that includes a Box Seat Legends playoff ticket along with an Outfield GA ticket for Rough & Rowdy for $30. This package is available now!